Our very own Peter Hadwen provided first hand insight into applying for a Rotary Global Grant and the work of Disaster Aid. It is clear he is really passionate about the impact the organisation can provide and the great work it is doing. He was successful in securing a $50k grant - well done Peter for the 25 page report you presented to the Grant committee!! Water quality causes many deaths when pathogens are present and this prompted the formation of Disaster Aid in 2010 as part of the Shelter Box project. It was a project of the RC of Endeavour Hills and is now it's own entity with DGR status. The organisation has a small administrative staff and fly 10 disaster response professionals to areas in crisis. Clean water is provided by the Sky Juice hydrant developed at a Sydney universtiy - the system has a 20 year life and can provide safe water at a cost of $1 per person per year and can provide water for 500 - 1000 people generating 1000 litres per hours. There are 61 units in the Philippines and Peter is working on a grant for 13 schools in Bhutan. 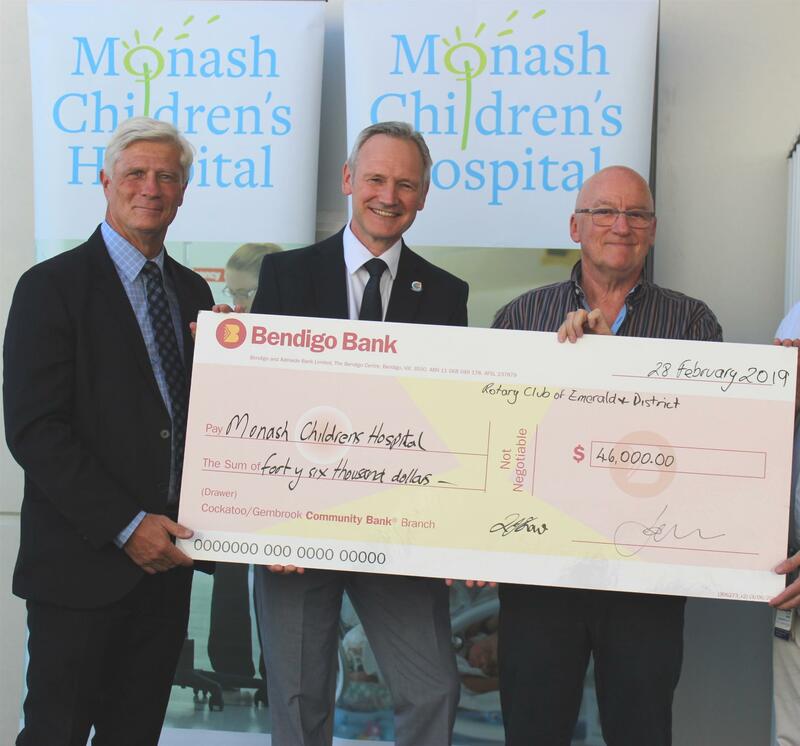 The Rotary Club of Emerald and District were delighted to present to the Monash Children’s Hospital Cancer Centre a cheque for $46,000 which were funds raised from the Kids Fun Run With Thomas last year. Ron Fairchild, Director, Monash Health Foundation received the cheque from Rotary Club President Ian Ash and the Kids Fun Run With Thomas Committee Chair, John Henderson. Dr Paul Wood provided information on the amazing research undertaken at the Centre. The Kids Fun Run With Thomas saw 544 participants run with Thomas The Tank Engine in 6 races for ages 3-12 yrs. The children themselves raised an incredible $17,623 on line and sponsorship from Barry Plant / Mitre 10 Emerald, The Wholesome Food Company, Ferntree Gully Motor Group and Lightning Press as well as the amazing input from Puffing Billy Railways helped swell the fundraising total. Sponsors Len’Donnell and Ben O’Connor were pleased to join the celebrations at the hospital. The Rotary Club of Emerald and District are pleased to announce funds from the event later this year will again go to the Monash Children’s Hospital Cancer Centre. Look out for the date confirmation (provisionally 24 November at the moment) - it is a special day where Kids Run For Kids! Just 268 sleeps to go TOOT TOOT! The 2018 Kids Fun Run WIth Thomas was a huge success - the RC of Emerald and District is delighted that so much was raised for the Monash Children's Hospital Cancer Research Centre and that everyone had such a terrific day.